The U.A.E. 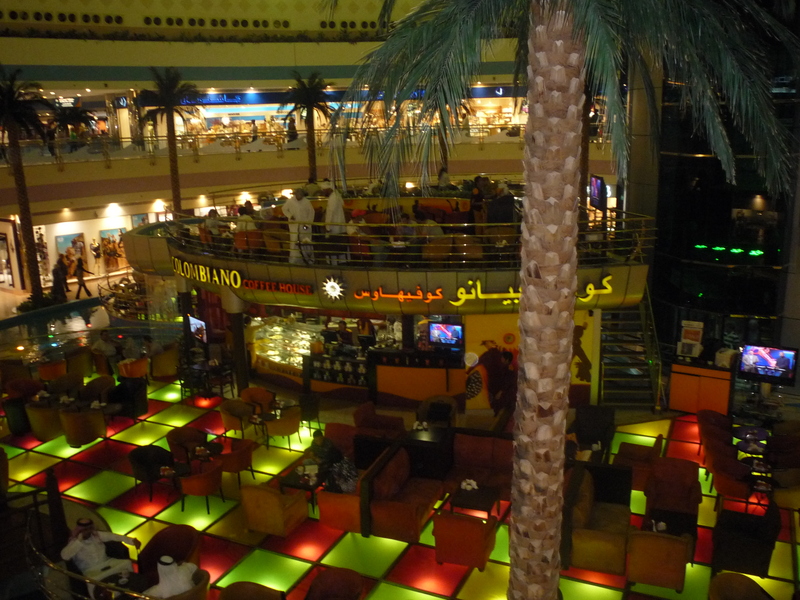 have 2 main international airports: Dubai Airport and Abu Dhabi airport. I arrived at Abu Dhabi, a huge and modern airport, that makes you feel transported to the future. Please bear in mind that the queue to exit the airport at the controls might be very long and take you very longtime (it took me 1h). – by taxi: the trip – depending on the traffic – can take 40mins. This could be the most suitable way to move, since in the U.A.E. taxis are ridiculously cheap (fuel is very cheap and currency conversion rate is very favorable). – by bus: if you prefer the public transport, there is a bus running from the three terminals and stops at all legal bus stops going into the city. It passes by the Bus Stand at Muroor and Street 11 and terminates at the Old Fish Market on Al Nasr Street (near NYU Abu Dhabi). The bus runs every 40 mins and takes around 45mins to get into the city, depending on the traffic. If you arrive in Dubai International Airport, you can also get a taxi to go to your hotel, the journey will take around 30mins (depending on the traffic conditions). There are also several buses to and from Dubai Airport and Abu Dhabi Airport and buses between the two cities. The journey takes around 2hours. Despite the jet lag, on the first day wake up very early and start exploring the city. The best way to move is by taxi, very cheap and very comfortable, whereas buses are very old and do not run frequently. 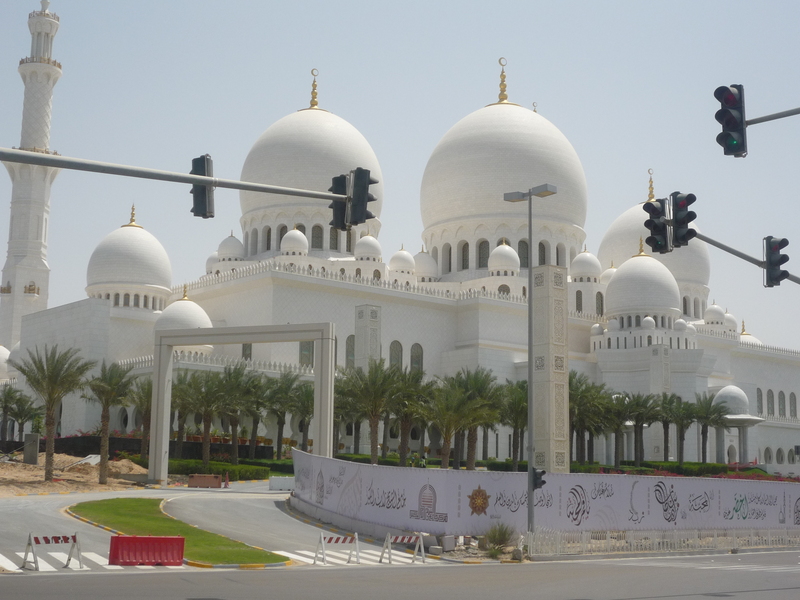 The first place to go and that you cannot absolutely miss is the Sheikh Zayed Mosque. 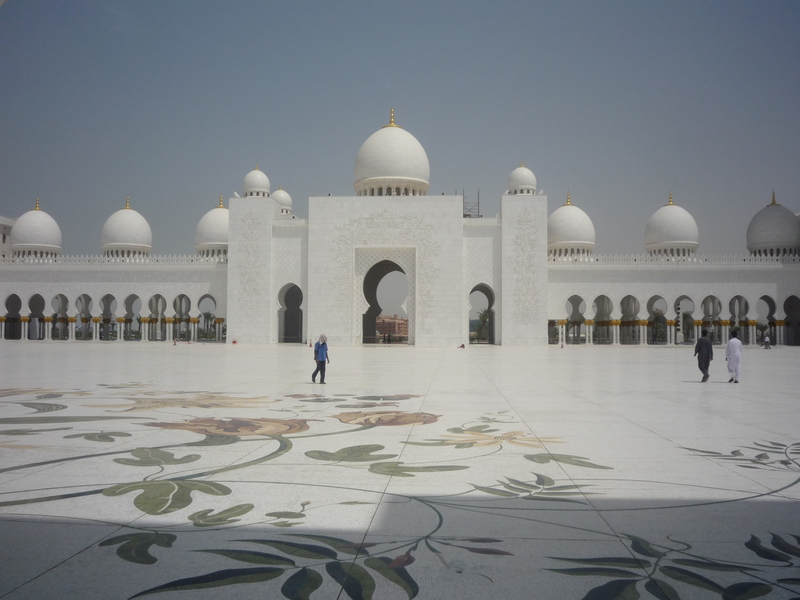 Sheikh Zayed Mosque: this is the second biggest mosque in the world (after La Mecca). 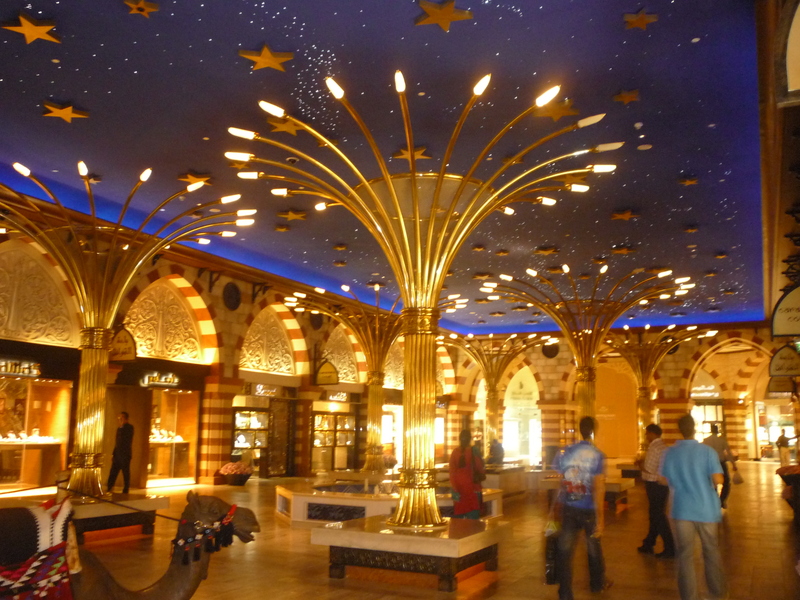 This jewel of the spirituality is located outside the main city, so you have to go by taxi. 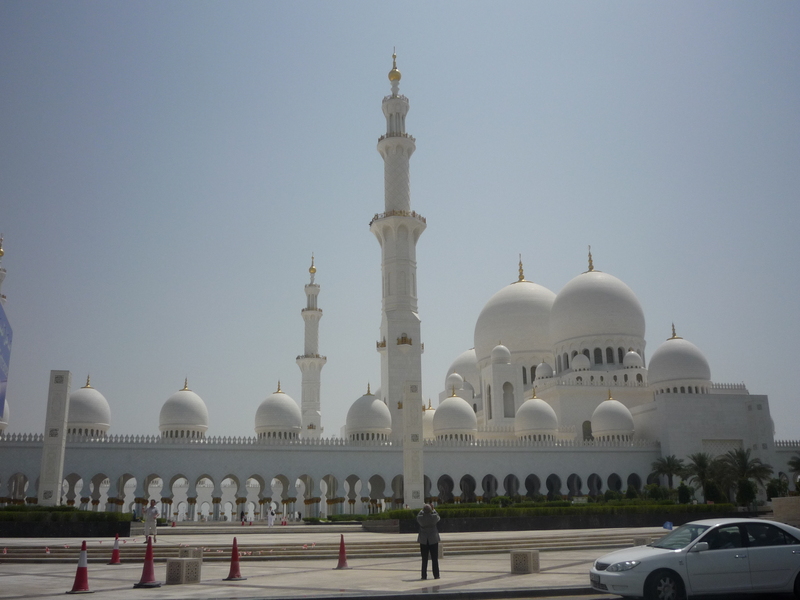 For me it is the most beautiful mosque I have ever seen! A corner of spirituality, calm and architectural charm. 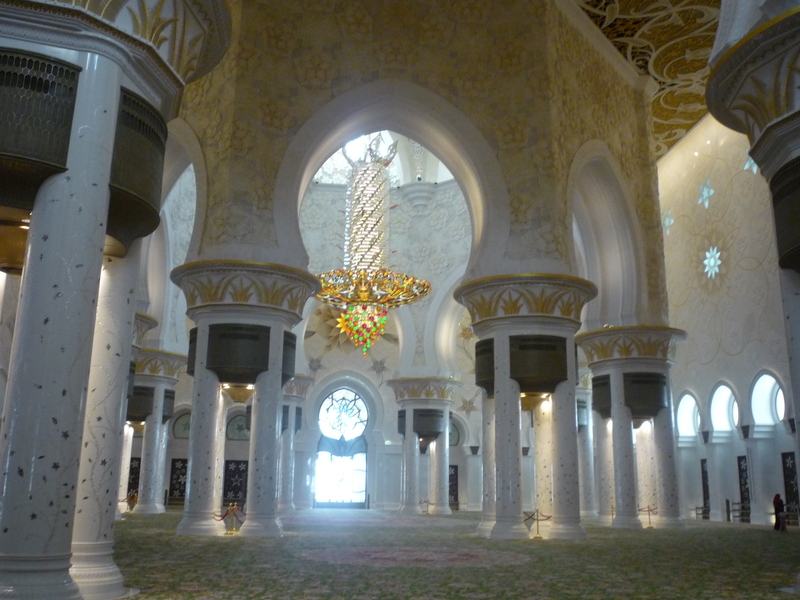 It is seen as a construction to ‘unite the world’, using artisans and materials from countries such as Italy, Germany, Morocco, India, Turkey, Iran, China, Greece and the UAE. The construction of the Mosque was finalized in the 90s. 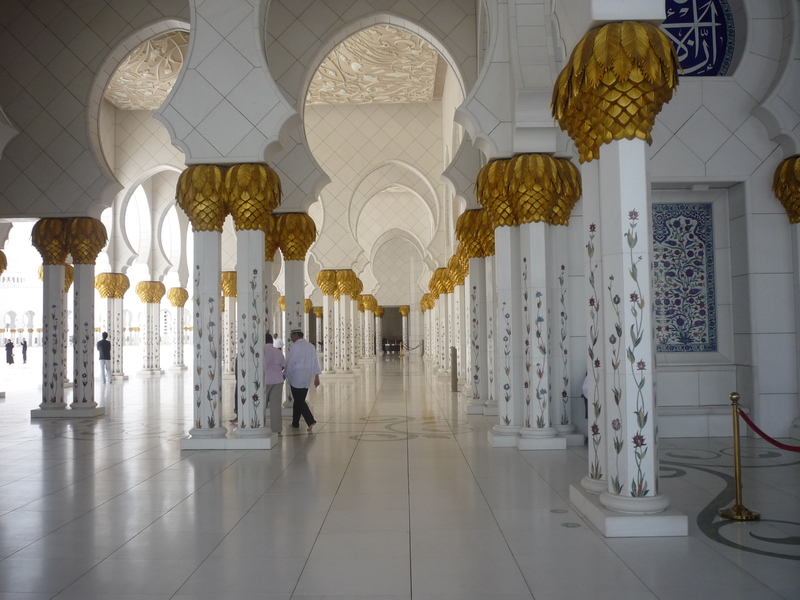 The first surprising thing is the brilliant white marble that forms the mosque, so pure and bright! Outside is a show of white columns with floral decorations, the interior is very sober but magnificent at the same time, with Murano-glass lamps, floral mosaics, golden pillars. Please note that the access to the mosque is allowed to everybody outside praying times. It is very important to respect the dress code: no short, no transparent clothes. Women will be provided at the entrance with a scarf and a black long dress, wear it as soon as possible in order to respect the regulation of the place. Now take a taxi back (better to reserve it at your trip to go, since there are not a lot of taxis outside the mosque) and ask the taxi driver to stop you in Corniche. 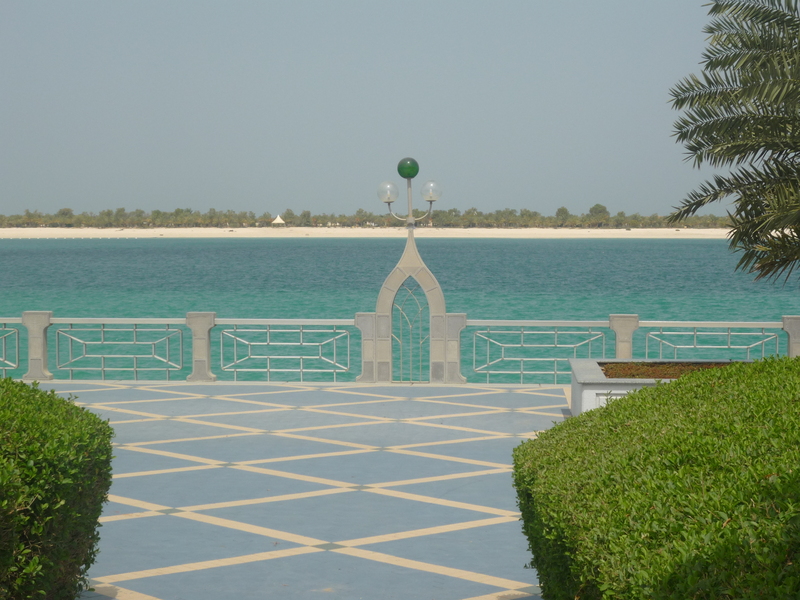 The corniche is a wonderful waterfront, you can have a long walk there (or ride a bike) and admire the wonderful landscape, or go to swim on the beach, the water looks like a swimming pool! This is the only place where people walk….yes because strangely people don’t walk there! It is probably because of the weather (in March it is still OK, but in summertime the temperature and humidity are so high that you really cannot walk), or also because of the structure of the city ( huge skyscrapers everywhere and wide roads, different from the European small streets made for walking), but for me it was so strange to see a city without people walking! Locals just have fun doing car racing in the middle of the city with their Ferrari or Lamborghini (I haven’t seen one single normal car there) and look at you weird when you walk, the only walkers are the foreigners from Pakistan or Philippines working like crazy in several building constructions.. 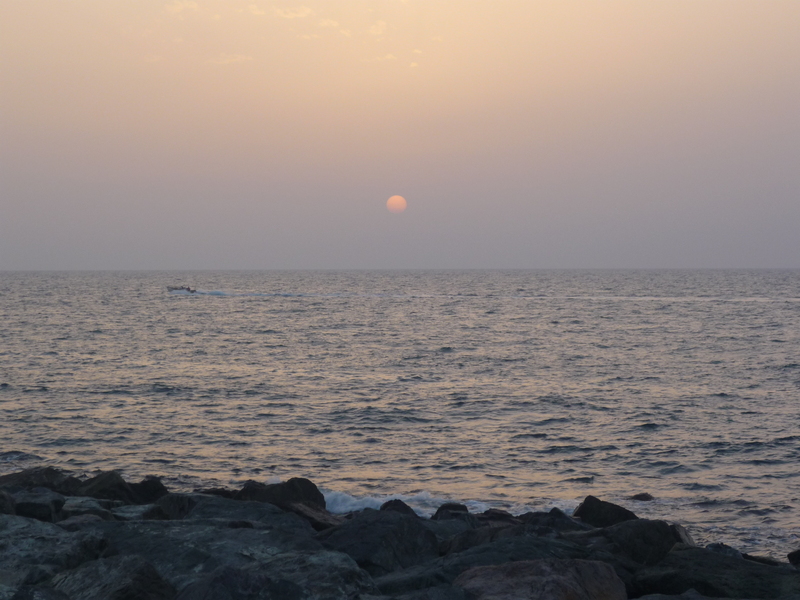 So I didn’t care and kept on walking along this wonderful corniche for many kms, it was a great sight. 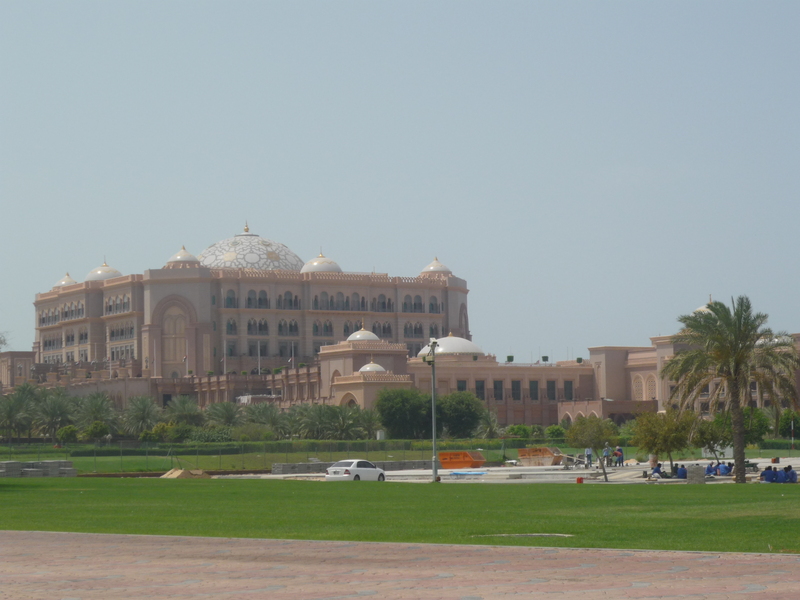 Emirates Palace: located at the end of the corniche, this is the greatest hotel in Abu Dhabi. It looks like a Royal Palace: the building is wonderful, with colors and gold seen from far away, and there is a huge garden all around. 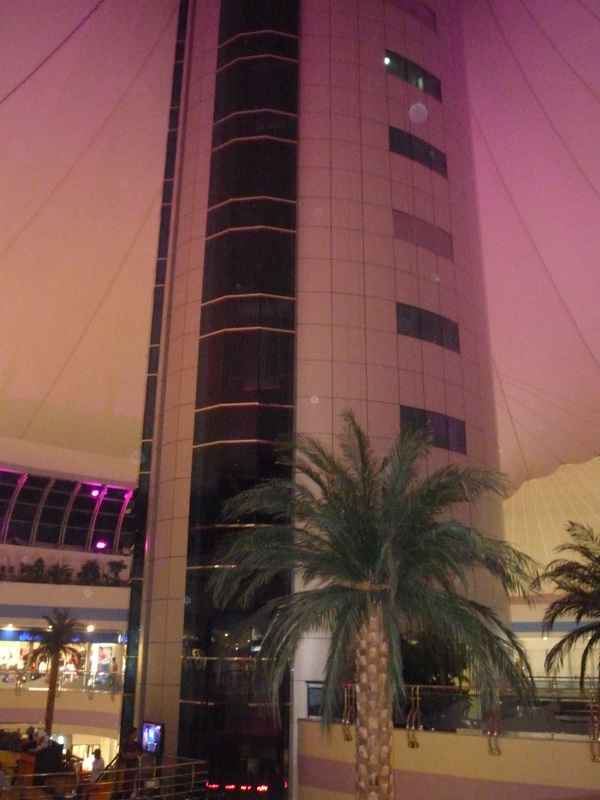 Marina Mall. 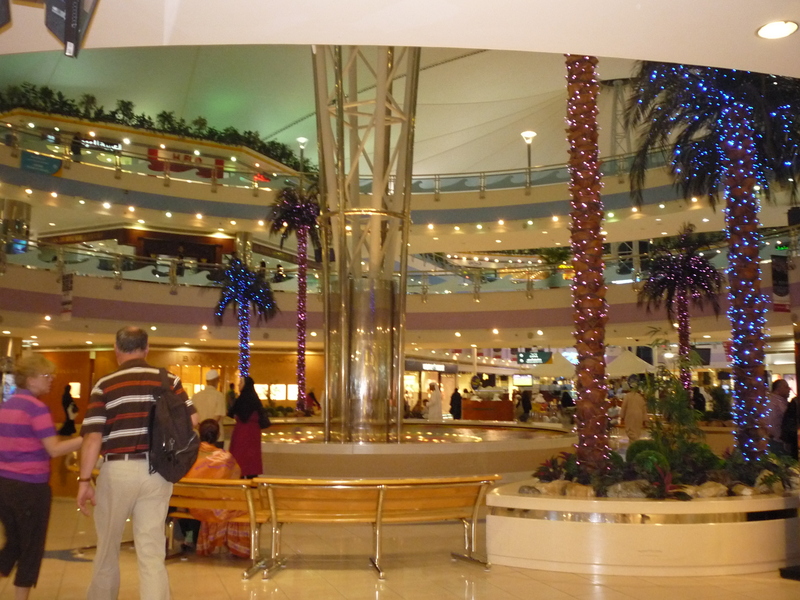 This is the Abu Dhabi mall, a huge structure with plenty of shops inside. This is the place where people hang out, especially locals. In general, they are nice and respectful, I have never felt unwelcome there. 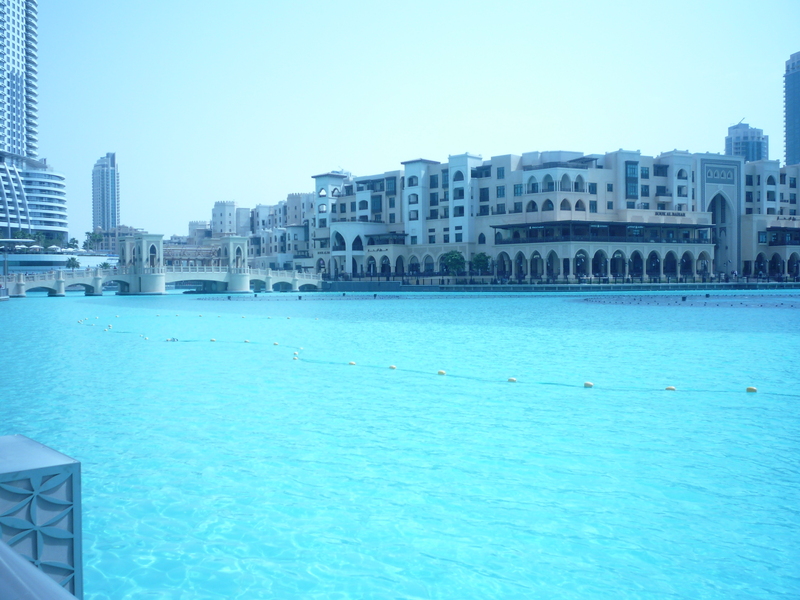 If you want to meet them they are all in the Marina Mall, walking along the shops, eating in the restaurants. I’m not a shopping fan, so I didn’t stay longtime there, but it was nice to see locals and go up the tower located in the middle of the structure; take the elevator there and you will arrive at a restaurant with a view on all the city…an amazing view, especially during the night! You will see the sea all around and the wonderful buildings along the coast. For modern architecture lovers, this is one of the places to be! Now go out of the Marina Mall (you can go back there also during the evening, since shops are opened till midnight) and take the street on your left, you will arrive at the Abu Dhabi theatre and at the Heritage Village. 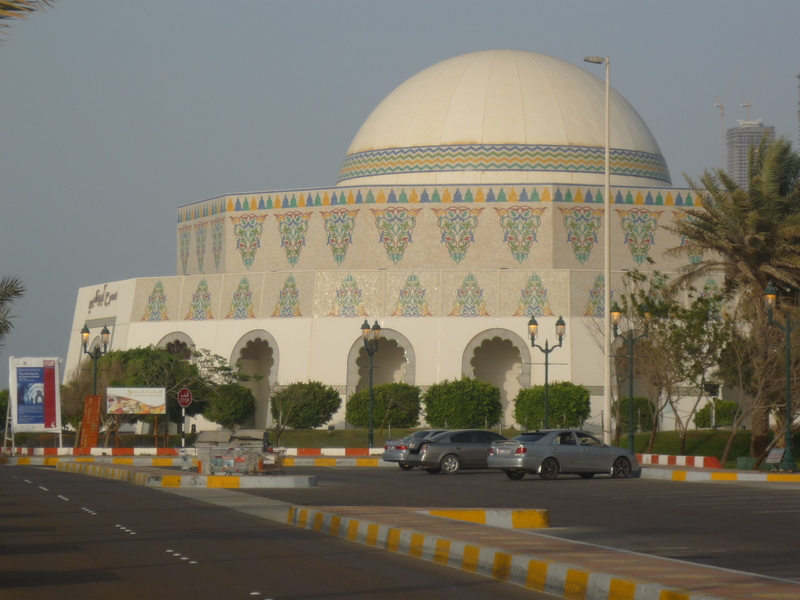 The Abu Dhabi theatre is a beautiful building with a roof plenty of mosaics and colors. On its right is the Heritage Village, the reconstruction of a traditional oasis village. 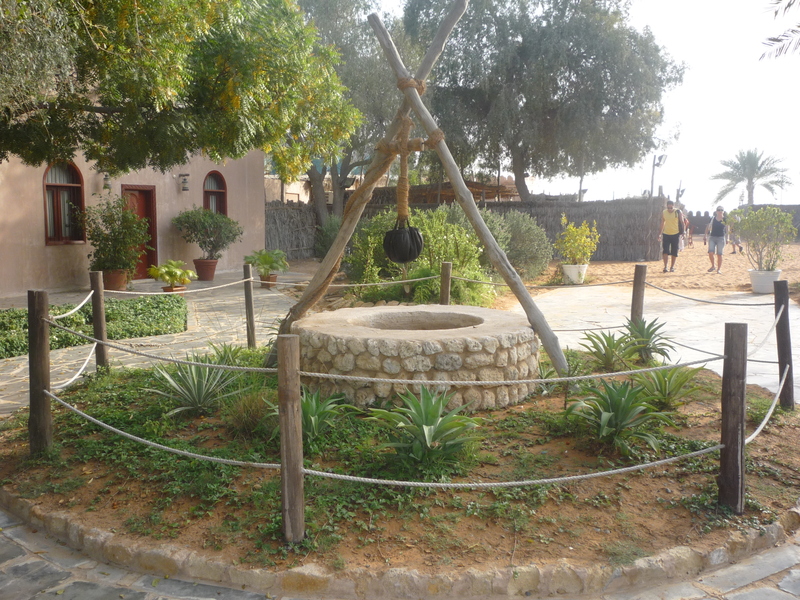 Traditional aspects of the desert way of life, including a campfire with coffee pots, a goats’ hair tent, and a falaj irrigation system, are attractively displayed in the open museum. There are workshops where craftsmen demonstrate traditional skills, such as metal work and pottery, while women sit weaving and spinning. 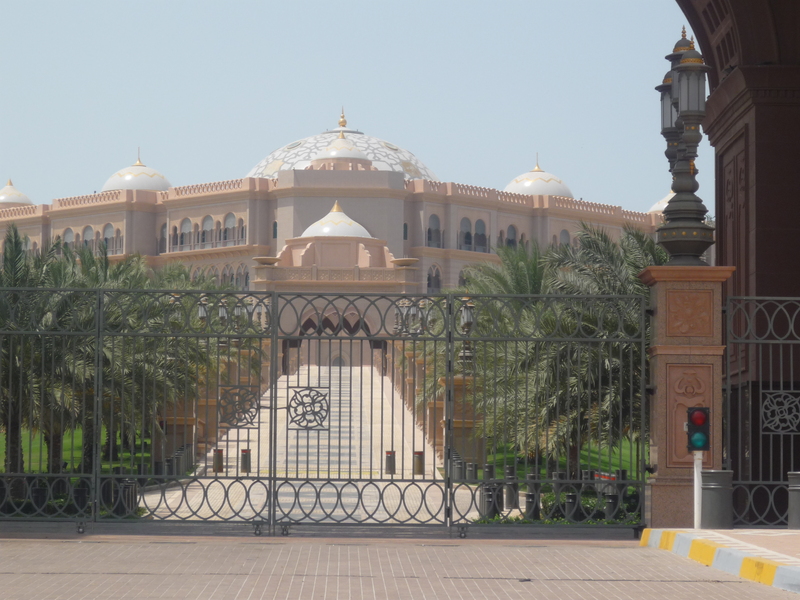 For Formula 1 lovers, you cannot miss the “temple” of the Formula 1 in Abu Dhabi, a wonder of the modern architecture. A short stop there by taxi is a must! Time now to leave Abu Dhabi and go to Dubai. If you rent a car, the journey will take you around 1h30mins (It is surprising to see that once you are out of the city there is nothing at all: no house, no people, just fuel stations). If you don’t want to rent a car and use the transport to get to Dubai, there is a bus service available between Abu Dhabi and Dubai. 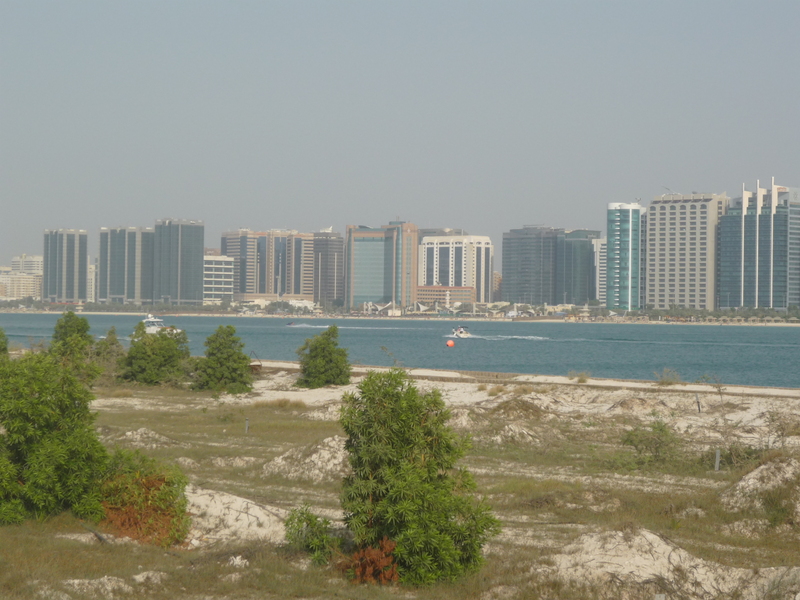 The bus departs from Abu Dhabi Municipality Bus Station to Al-Ghubaiba Bus Station in Bur Dubai, just near the Creek. The frequency of the service is about every 40 mins. The journey takes 2 hours. Once you arrive in the city, you will be breathless: as in Abu Dhabi, you will be in a paradise of contemporary architecture. Very high skyscrapers in different shapes, wide streets with fancy cars, a modern metro connecting the city, and an amazing coast with bright-blue sky. Everything in that city smells luxury: the buildings, the cars, the people. The city is very big and spread so you need to move by taxi or by metro. 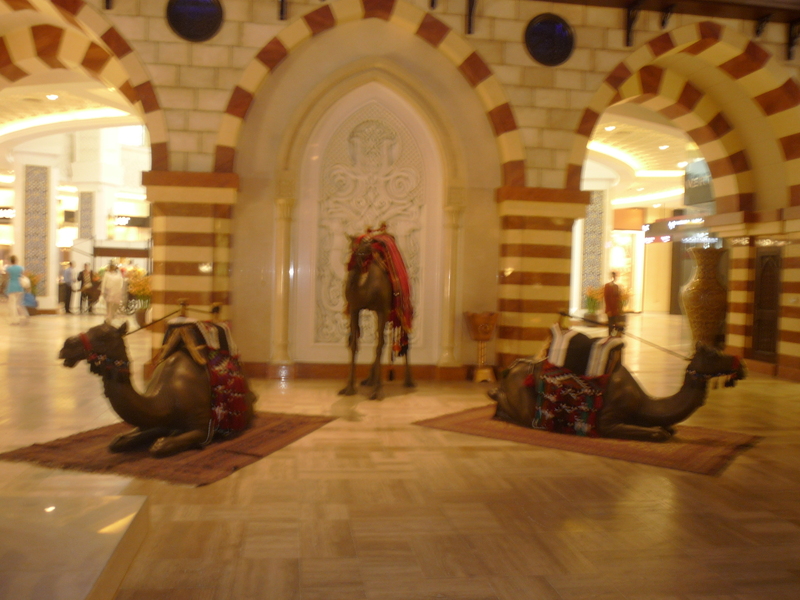 Dubai Mall: this is a huge shopping mall with fancy shops, fountains, chic bars. 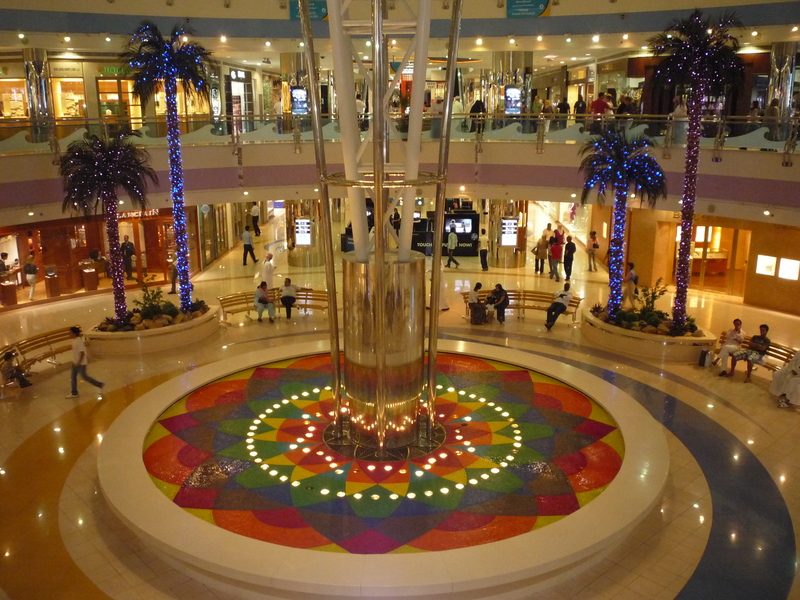 If you are a shopping lover, you can spend the entire day there…but it’s not my case, so go out from this mall and just there you will be in front of the amazing Burj Khalifa, a jewel of modern architecture and engineering. 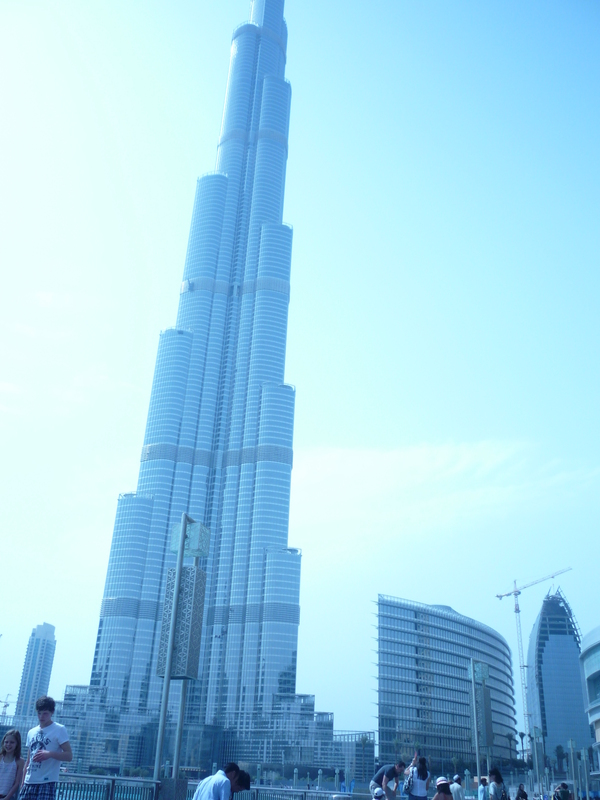 The world’s tallest building pierces the sky at 828m (to give you an idea, seven times higher than the Big Ben) and opened on 4 January 2010, only six years after excavations began. Inside are offices, apartments and the chic Armani Hotel. Unfortunately when I was there the tower was closed but I strongly suggest you to go to the top and have the entire view of the city. All around the tower is a huge fountain (the biggest fountain in the world) – so huge that can be seen as a small lake – and very nice buildings. 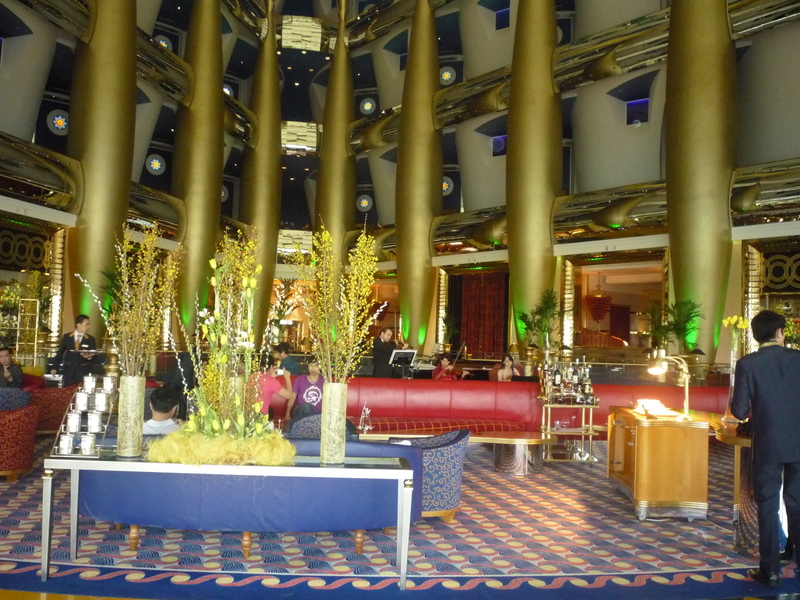 Burj Al Arab: this is the most grandiose and exemplified hotel in the world. 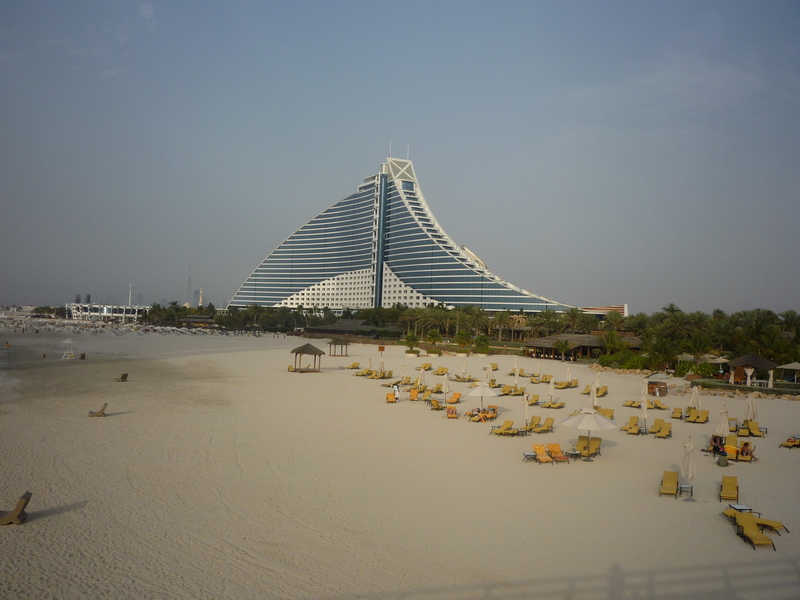 It is the world’s first seven-star hotel and stands like a glittering gem on the coastline of Arabian Sea. It is a splendid example of stunning architecture with a soaring height of 312 meters dominating the magnificent Dubai coastline. Built on a man-made island, this hotel is 280 meters away from offshore. 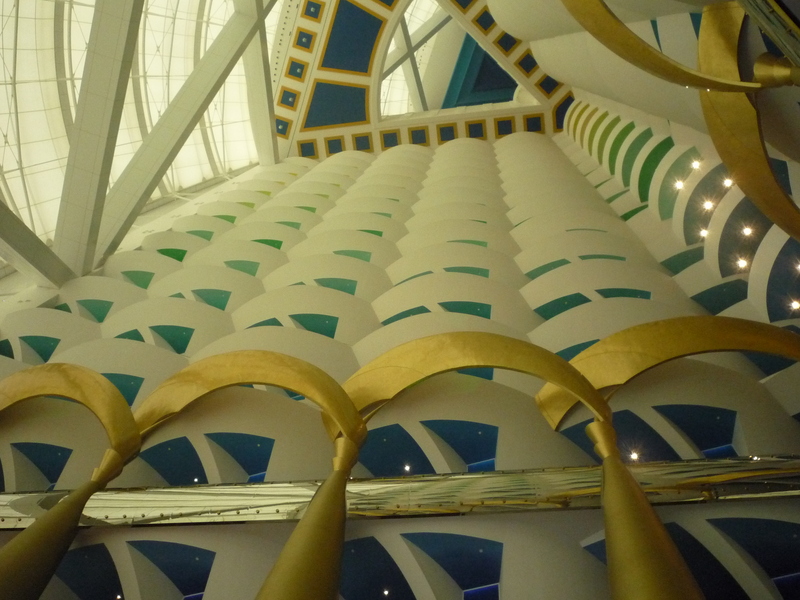 This hotel is popular among the tourists because of its manifestation and astonishing appearance. I had the chance to get in there thanks to my wonderful local friend. 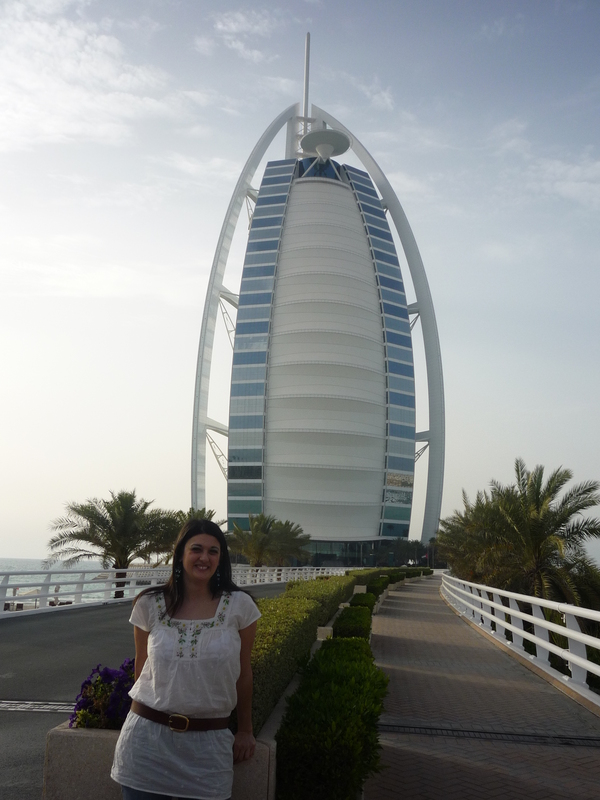 From the Burj Al Arab you can also see the Jumeirah hotel, another amazing architectural jewel. Staying in the modern world of Dubai, another thing you cannot miss is the Palm Islands, the three largest artificial islands in the world. Each of the islands is shaped like a palm leaf, with a trunk connected to the mainland, fronds extending from the trunk, and a crescent (a breakwater encircling the trunk and fronds). 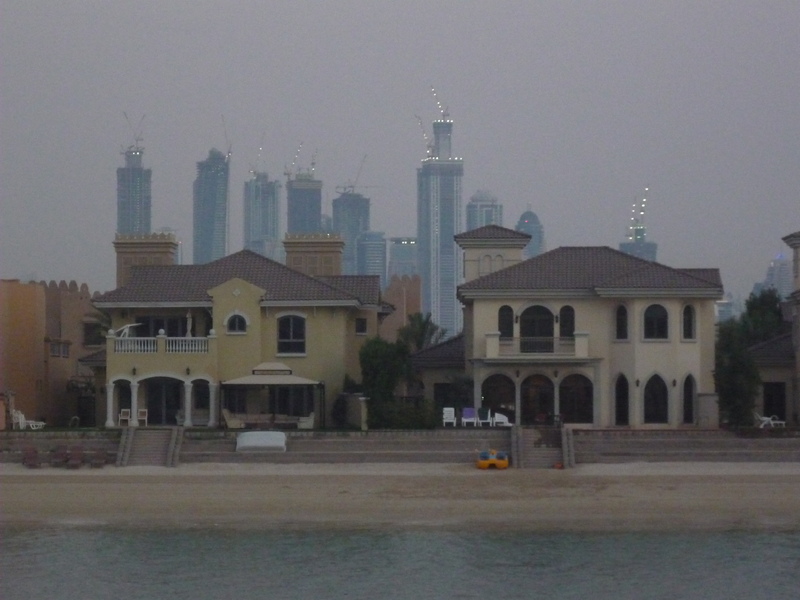 Of the three planned, the Palm Jumeirah, near Dubai Marina, is the only one yet open, connected to the mainland by a freeway bridge and a monorail and sporting marinas, luxury resorts, and upscale shopping areas. 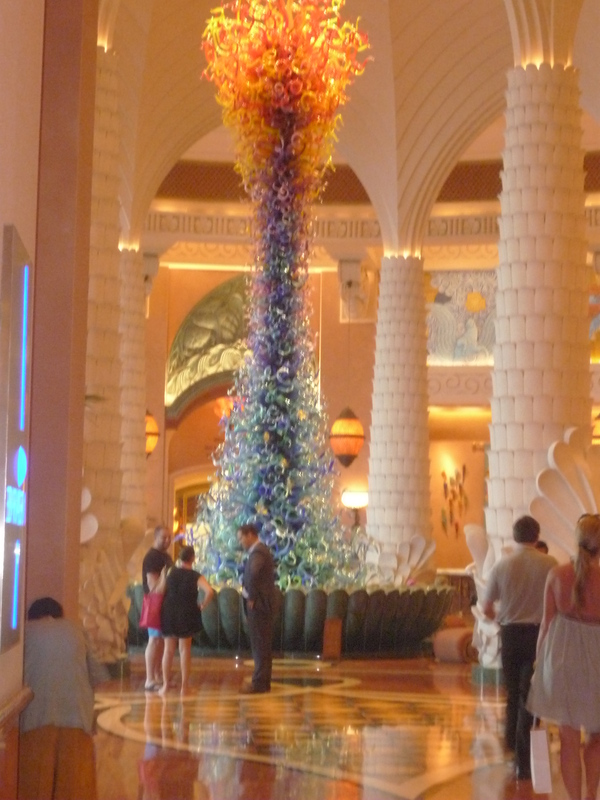 Take some time over there to visit the Atlantis Hotel, with its huge Murano-glass lamp in the hall and with its huge aquarium with its hundreds of different species. 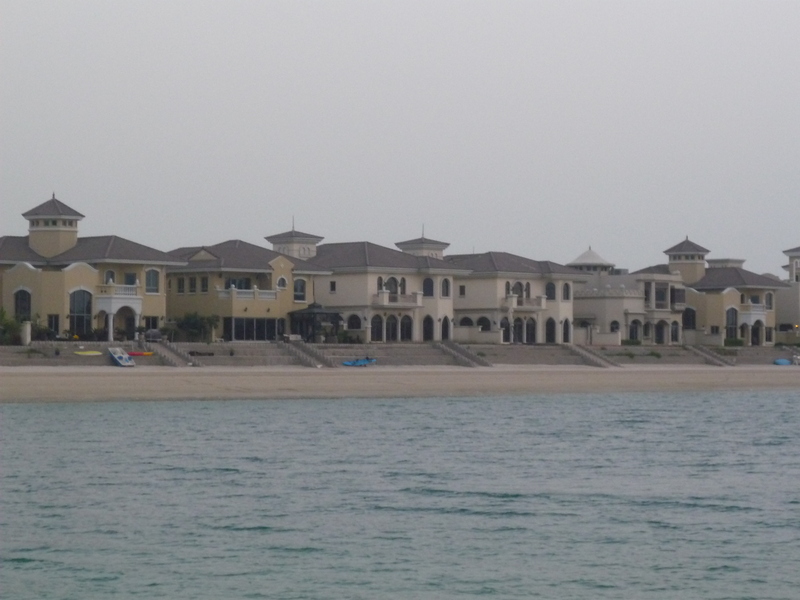 Leave Palm Islands and go to Dubai Marina, one of the popular areas of Modern Dubai. It offers numerous features such as a phenomenal skyline, world class hotels, a fabulous beach, a mall, and 2 different walkways (The Walk and Marina Walk) with coffee shops, restaurants, and shops. 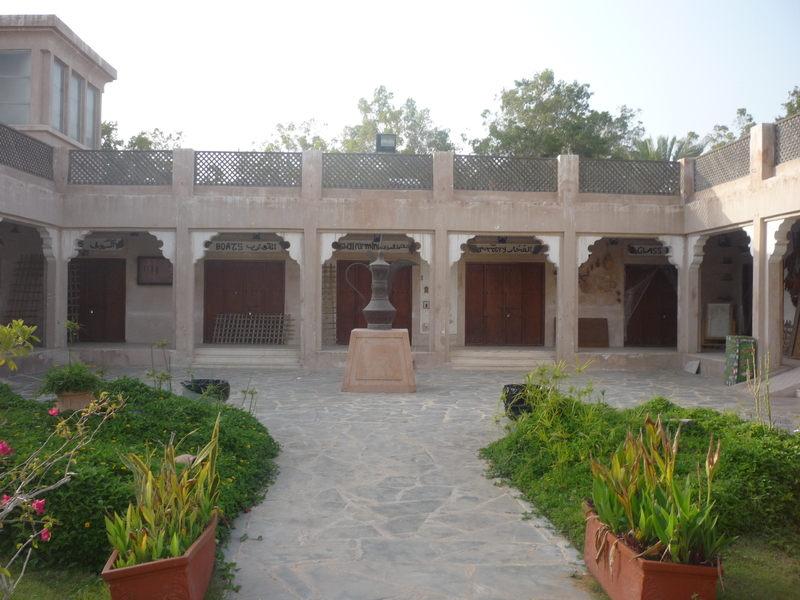 If you want to leave now the modern Dubai and have a tour in the past, you can visit the Dubai Museum, a museum hosting pieces of the social history of the Emirate. You can see the al-Fahidi fort, which has few examples of the traditional reed houses and other artifacts, and an exhibition (underneath the fort) on Dubai’s history accompanied with authentic sights and sounds. It is quite fascinating to see the speed at which the transition from poor pearling village to modern metropolis occurred. Another pearl of this city is the Jumeirah Mosque, a wonderful example of Islamic architecture built in the medieval Fatimid tradition with the interior decorated with elaborate Arabic calligraphy. 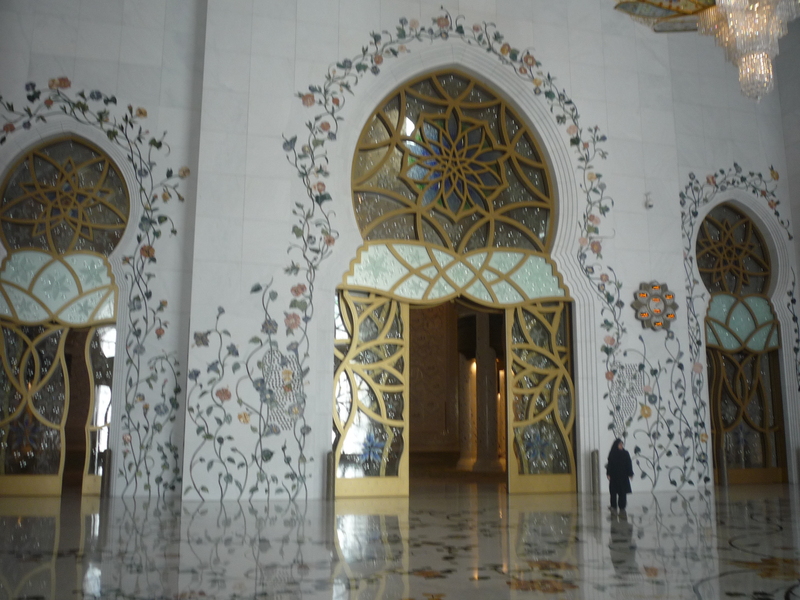 It is one of few mosques in the city open for visits by non-Muslims, the Sheikh Mohammed Centre for Cultural Understanding conducts special tours for non-Muslims to help promote understanding of Islam. 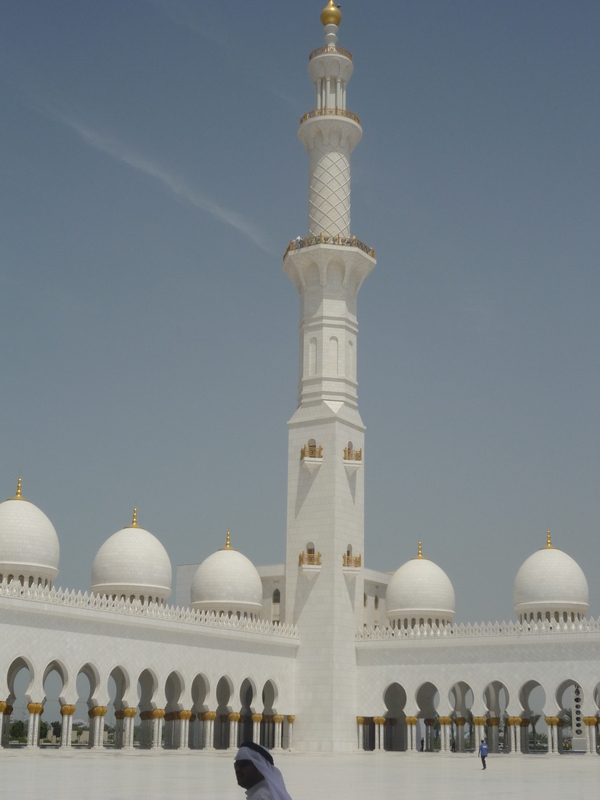 Located on Jumeirah Road, the mosque is a great place to visit in the evening when it’s illuminated by floodlights. 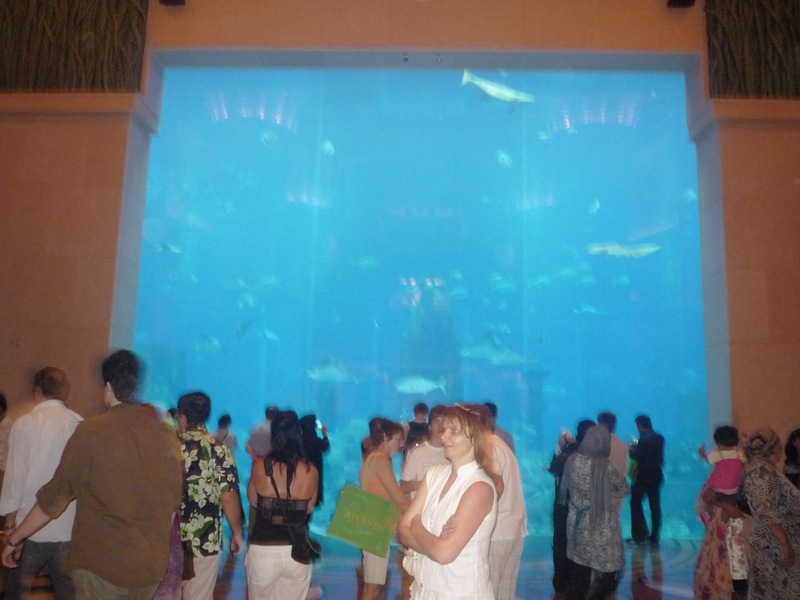 Dubai is not only a place for sightseeing, but also a place for activities. The city and its nature offer a wide range of possible things to do, such as: beach, desert safari, ski (yes, also ski). 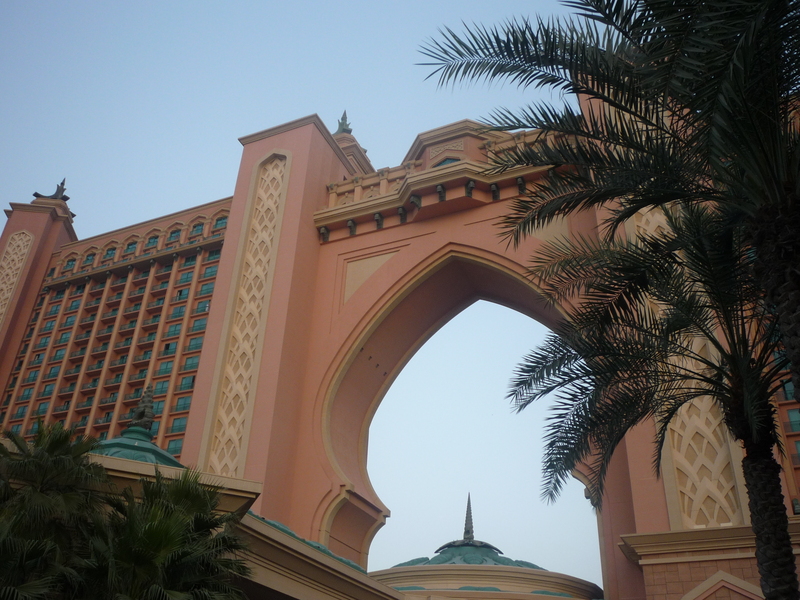 On the last day in the U.A.E., I had a last short tour in Dubai and went back to Abu Dhabi (because I had my flight there), but I suggest you to take the flight back from Dubai, so that on the last day you will have more time to visit the city. You can either do one of the activities above or visit something or just relax and do some shopping.